I can’t remember the first time I had a Banh Mi and it certainly wasn’t at a restaurant. 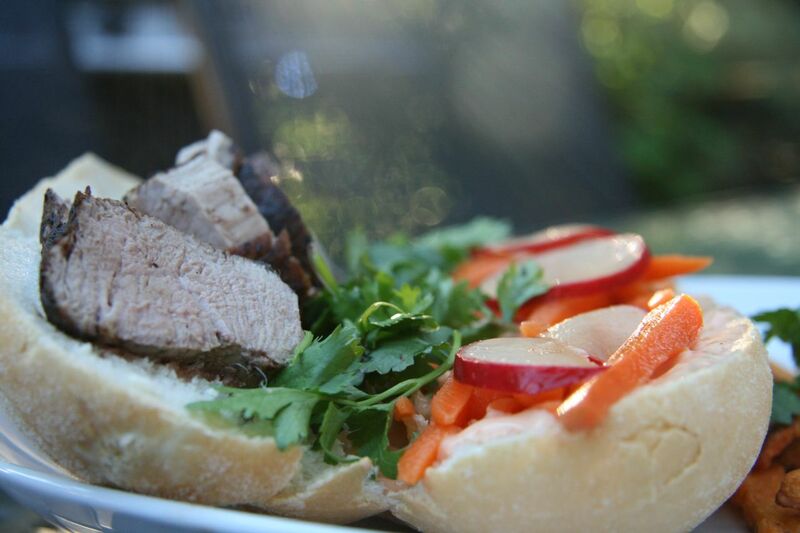 In fact, now that I am dusting away at my memory cobwebs, I think I was searching in my Google Reader for a recipe when I had a pork tenderloin to use-up a while back and came upon Bridget’s recipe for Banh Mi and knew I couldn’t go wrong. Why couldn’t I go wrong…because the flavours are oh-so-right (lame, I know!). But Banh Mi has a flavour profile that just has to be given high-praise and as a bonus, it truly is a quick and easy meal to prepare. As Bridget describes in her post, it isn’t the most authentic recipe, but I agree with her that “taste will trump authenticity every time”. Don’t get me wrong…this is pretty close to authentic (although I am soon to test that statement when I finally get over to Banh Mi Boys in Toronto). Nonetheless, this is a great recipe. I, like Bridget, made a few switches, didn’t bother with a mandoline – hand-slicing worked just fine and I used greek yogurt to lighten-up the mayo. Definitely give this inexpensive meal a shot if you are looking for a new twist on your pork tenderloin recipes, or just a delicious sandwich to impress! 1. Combine vinegar and sugar in microwave-safe bowl. Heat until sugar has dissolved, about 90 seconds. Add 1 tablespoon sriracha, 2 tablespoons fish sauce, radish and carrot to bowl and toss to combine. Set aside for 15 minutes. 2. Meanwhile, whisk mayonnaise, remaining 1 tablespoon sriracha and remaining 2 tablespoons fish sauce together in second bowl. Set aside. 3. Ensure your pork is dry (rub with paper towel) and rub pork with five-spice powder. 4. Cook Pork (choose whichever method you prefer – I’ve done both and they are equally as good). Grill pork over hot burner until browned on all sides and pork registers 145 degrees, 12 to 14 minutes. Heat a cast-iron skillet over medium-high heat and grill pork for approximately 6-7 minutes, per side, or until pork registers 145 degrees (I rotate my pork 4 times, so each side is nice and brown). Transfer cooked pork to cutting board, tent with foil, and let rest 5 minutes. Grill bread until lightly toasted, about 1 minute (not essential). 4. Slice pork crosswise into thin slices. Drain vegetables. Spread mayonnaise on inner sides of bread halves. 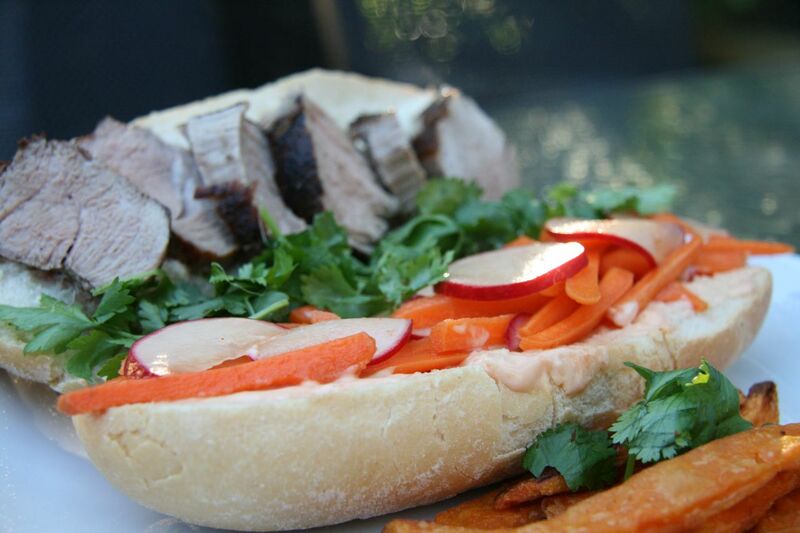 Arrange slices of pork on bread and top with vegetables and cilantro. Serve.